Days after Harvard announced the results of its massive Government 1310 cheating investigation, lawyers who have consulted with accused students say the door is still open for legal challenges against the University. Attorneys interviewed for this article acknowledged that litigation would be difficult because of the apparently scrupulous nature of Harvard’s investigation and its status as a private institution. Still, they say, the statute of limitations leaves ample time for specific student grievances to emerge. Last August, Harvard announced that it was investigating about 125 students for inappropriately collaborating on a final take-home exam in last spring’s Government 1310: “Introduction to Congress” course. During an investigation which spanned the fall semester, more than half of the accused undergraduates—approximately 70 students—were asked to temporarily withdraw from the College. An additional quarter of investigated students were put on probation. The University has not publicly indicated whether it has faced any litigation connected with the scandal. When the scandal broke last fall, lawyers speculated that lawsuits stemming from the scandal would hinge on whether the Administrative Board adhered to its procedures as described in the student handbook. Now that the investigation is complete, attorneys say that the Ad Board appeared to closely follow its delineated rules throughout the probe, making lawsuits less likely. 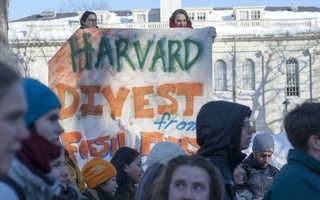 In addition, they say, Harvard’s status as a private institution makes it difficult for students to sue the University after a disciplinary proceeding. Michael R. Schneider, a Boston lawyer who has consulted with several undergraduates accused in the scandal, said that disciplined students face an uphill battle when they bring civil cases against private universities. In Massachusetts, such cases require a heavy burden of proof on the part of the student, according to Harvey A. Silverglate, a Cambridge lawyer who has advised Harvard students facing Ad Board investigations since the late 1960s. Silverglate said that Schaer vs. Brandeis University, a case heard by the Massachusetts Supreme Judicial Court in 2000, sets a high bar for students who want to sue private universities. In the case, a student sued Brandeis for failing to adhere to its official procedures in a sexual assault investigation. The court ruled in favor of Brandeis, a private institution, on the grounds that universities are “not required to adhere to the standards of due process” used in criminal or civil courts. “Schaer vs. Brandeis makes Harvard very close to invulnerable,” Silverglate said. Despite these hurdles to student litigation, lawyers emphasized that lawsuits may still have enough heft and time to come to light. After Harvard issues verdicts to the roughly 125 undergraduates being investigated for academic dishonesty in Government 1310: “Introduction to Congress,” several lawyers predict that the University could face a slew of lawsuits from students facing punishment. The Lawyers’ Committee for Civil Rights and Economic Justice is preparing to intervene against a pending lawsuit that alleges that Harvard uses “racially and ethnically discriminatory policies” in its admissions process.